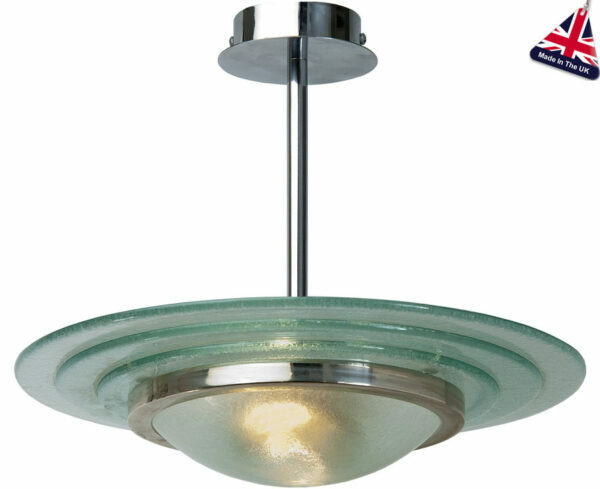 Round polished chrome ceiling plate and central support rod, with rings of layered fused glass and a chrome support ring holding the bottom domed glass light diffuser. The glass has a pale green hue as would the originals. A stunning polished chrome Art Deco style semi flush ceiling light, hand-made in the U.K. to the highest standards. Takes 2 x 25w halogen lamps to create subdued background lighting. With an overall height of just 300mm, this ceiling light is perfect for rooms with a lower ceiling.